In the fall of 2015, university students in South Africa protested the announcement of impending tuition fee hikes of 10%. In initial response to the protests, the South African government promised to only increase tuition by 6%. After about two months of continued, intense demonstrations that closed many of the country’s universities and postponed exams, President Jacob Zuma finally announced in late October that tuition fees would not increase at all in 2016. Although university students were happy, the deal was only good for 2016 and many feared that more tuition hikes would come in 2017. These fears came true when a year later, the government announced that it could not sustain high-quality education without tuition hikes. Thus, President Jacob Zuma decided universities would independently determine how much they would raise their tuition, but the government would set a cap at 8%. Student protests have resurged in light of this announcement and the conflict has not yet been resolved. Although the ‘Fees Must Fall’ movement began because of tuition fees, the student protesters are fighting issues that have a long history prior to 2015. The tuition hikes are just the latest in a string of government policies that have most harshly affected black South African students because of the inequalities they still face in a post-apartheid era. 60% of black South Africans still live below the poverty line, which is actually worse than the conditions during apartheid. Rural black towns have the least access to preschool and elementary education, which leads to the black population of universities being very small. All these factors show why tuition hikes will slam black South African students, and why these young people are at the forefront of protests. This is not the first time in South Africa’s history that black students have had to demand change and fairness. In the 1976 Soweto Uprising, students protested the implementation of Afrikaans, a language that was primarily spoken by white South Africans, as the language used for half of the classes in public schools. Black South Africans very rarely spoke or understood Afrikaans and they would have been at a large disadvantage in their education. Similar to present-day protests, the uprising was initially about one issue. This issue was with regards to Afrikaans in schools, but it was really a movement that erupted because of many inequalities, including the Bantu Education Act, which provided inferior education to black South Africans. Although change would not come for many decades after the uprising, it was a symbol of the fight against racial inequality in South Africa and began the long road to change. Violence was common theme in both the 1976 Uprising and the ‘Fees Must Fall’ movement today. In June 1976, the biggest student protest resulted in police opening fire on the crowd and injuring hundreds of students and killing many. 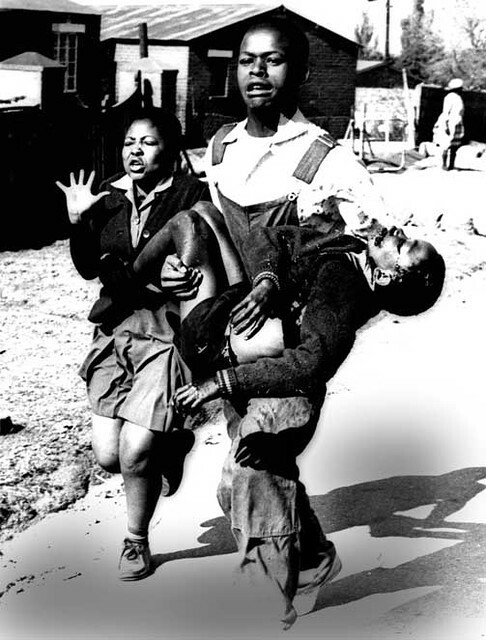 Most famously, twelve-year-old Hector Pieterson was thought to be the first student shot and killed by police. He then became a symbol of the uprising. The protests started peacefully, but took a violent turn when police began shooting. The ‘Fees Must Fall’ movement in 2015 and 2016 also faced violence. On some occasions, police caused violence among a peaceful crowd. At other times, protesters became violent and police had to use force to calm the violence. Police have used stun grenades and tear gas as methods of deterring and controlling protests across the country. Protesters have thrown stones and rocks during demonstrations and a bus in Johannesburg was set on fire. 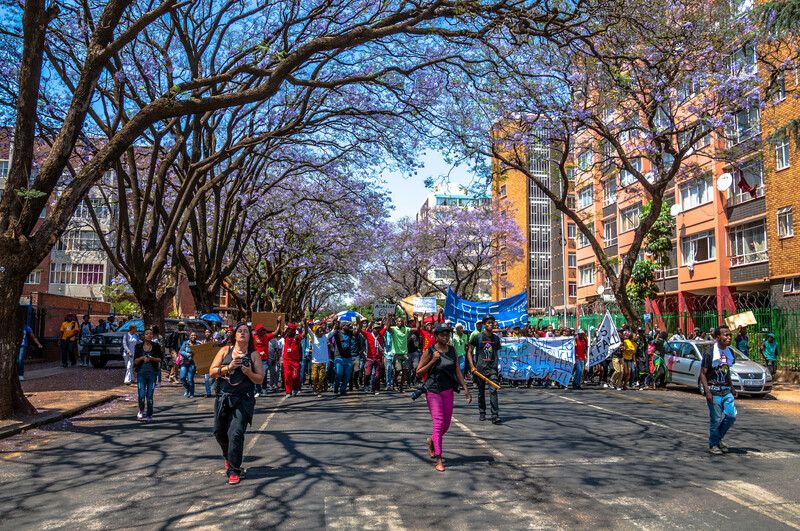 Many condemn the violence that current protests have turned to, and for valid reasons; violence prohibits students at the universities from studying, and it causes damage to the property and economy of many cities. Although the violence is not near the level of what occurred in the United States in Baltimore, Maryland in 2015, many of the arguments condemning the violence, but supporting the underlying cause, are the same. 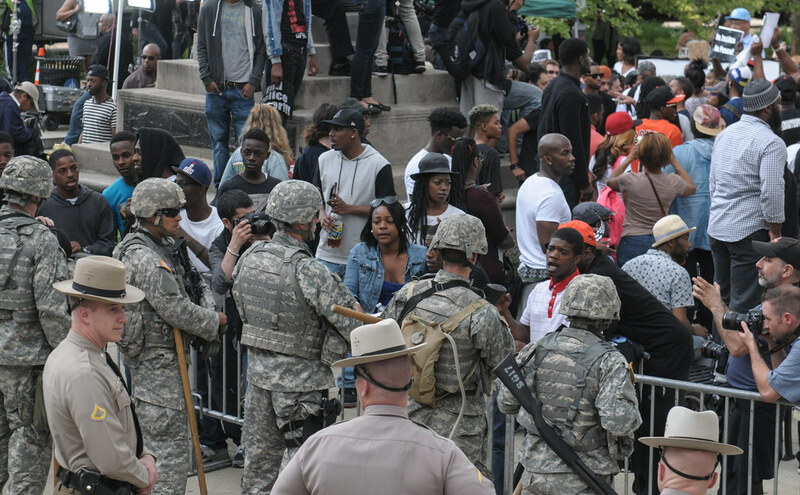 Many citizens of Baltimore, as well as President Obama, who were angered by police brutality and supported the protest in general, nonetheless condemned the violence and destruction of the city because of the devastation it caused the entire community. In both South Africa and Baltimore, the violent aspects of the protests are a result of extreme frustration with the lack of change in policies and practices that are specifically harmful to black people. By 2015, police brutality had become so commonplace in many cities across the United States that when Freddie Gray was killed in Baltimore, protesters felt they had no other way to enact change but to take to the streets and commit acts of both peaceful and violent protest. Although there could have been other forceful, yet safer ways to get their message across, the method did work. When images of the violence went viral, the attention of the world was turned to Baltimore and officials were forced to address the issue. Although change to the Baltimore police department has been slow and many have criticized it, some key policies have been put into place. For example, surprise checks of prison transport vans have resulted in 100% of prisoners being put in seat belts (Freddie Gray was not). In the two decades since apartheid was demolished in South Africa, very little advancement has been made for the conditions of black South Africans. They still live vastly unequal and unfair lives compared to their white counterparts. Systemic change, like what is needed in South Africa, is a long process, but there should be improvement along the way, and South Africa has not shown that. With the most recent announcements concerning tuition hikes, black South Africans feel once again that they will be particularly burdened by a government policy and need to protest. Although violent protest can result in harm to people and property, it can be in many ways one of the most effective forms of protest. It remains to be seen if South African university students will be successful in stopping the proposed fee hikes, but if Baltimore is an indication, there is reason to believe they will have some success. In the long run, the loss of property and the disruption of everyday life is a small price to pay for the removal of inequality. Yet, the loss of human life in protest crosses another line, and both protesters and law enforcement in South Africa should be careful to not escalate the violence to the level of the 1976 Uprising.